I was in a quandary over how to charge two phones from the front charging pads AND use my USB flash drive for music. As most know, the wired charging pad in the console is the only place where data is transferred to the Model 3. Also, I have ordered a Nomad wireless charging pad, and it is suggested that both USB ports be used in order to obtain full charging. I ordered a compact USB hub from Amazon, and used my USB tester to determine if there was any loss in amperage due to the hub. I am attaching photos of my tests. 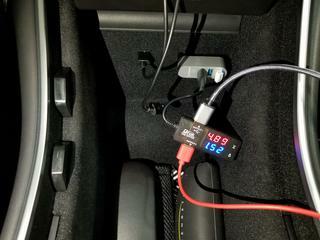 My cheap little tester shows 1.14 amps from the hub at 4.96 volts. (The little white thing on top of the hub is my USB flash drive.) For comparison, I also photographed the right side without the hub, showing also 1.14 amps at 5 volts. I moved to the house and took a photo with a standard USB and also got 1.14 amps at 5.24 volts. I was starting to get worried that my USB meter was stuck at 1.14 amps. So I tried a known slow charge USB port on my computer. This showed 0.38 amps at 4.97 volts. So it looks like I will be using the USB hub to use my data off the flash drive, while also charging my phone. FYI, the music does play just as exceptional with or without the hub. Can you post the links to the hub you purchased for your project and also the meter? I’d like to look into both of them myself. An update. I realized that I may not have been using enough power to get an accurate reading. I placed two cell phones on the tester outputs for more amp draw. I did get a change. With two cell phones drawing amperage, I show 4.96 volts and 2.30 amps without a hub. With a hub, I show 4.92 volts and 1.51 amps. So with a hub, there is a loss of 0.8 amps. Whether this will make much of a difference is up to you. Interestingly, I compared that to the draw from a 2.5 amp rated power port (cigarette lighter) adapter and got 5 volts at 1.62 amps. Weird that the power port on the Model 3 isn't producing more amps, but maybe that's my adapter? I have photos of all tests, if someone would like to see them all. I didn't realize amps volts and wattage was such an easy calculation. Voltage (V) is the water pressure. Amperage (A) is the volume of water flowing through the pipe. Wattage (W) is the rate of water output, which is found by multiplying the voltage by the amperage. All of these watt numbers are based on using two Samsung Galaxy S8+ cell phones as current draw. I assume that the Nomad and other wireless charging pads can draw more power, so your experience will vary. Here is a final update photos using two Samsung Galaxy S8+ phones for the current draw and the new aluminum USB hub. The hub allows 7.4 watts on these two phones. Once I (eventually) receive the Nomad wireless charging system, I will provide actual watts from the device from the left port and the right side hub. Have you actually used this hub to charge more than one phone at a time, and also used it for music simultaneously? The product listing specifically says the max combined current draw is 900 mA (which is the USB 3.0 spec limit for a data port), and that it's not meant for charging, only data. A frequent problem with trying to use a bus-powered hub for charging is that pulling too much current can destabilize the data connection, so even if you can charge, you can't use it for data at the same time. The better approach would be to get a hub with an external power supply that can be connected to the 12V power port - that would be able to provide multiple amps per port for charging, and still allow data on at least one port. BTW, what you said about amps vs watts is true, but since normal USB is always 5V, most discussion of USB charging limits and capacity refers to the current draw. Watts come in to play when looking at non-USB charging, like inductive, or when dealing with USB-C which can deliver more than 5 volts. Thanks for your comment. I have no experience with low voltage items, so any suggestions are appreciated. I used both S8+ phones off the tester and both were charging the phone battery, and I played the USB music as well. I'm not sure how much one-half of the 6,000mAh battery inside the Nomad wireless charging pad will draw. The USB music playing was stable, but that was with a draw of around 2 amps. I can't find any such info on the Nomad specs. If I went to the trouble to power a hub, I would probably just use the power tap to run the phone or wireless cords instead, and a hub would be unnecessary. I guess I will have to wait and see how much power the wireless Nomad draws and how the hub reacts to that. This is all the fault of Tesla, who made data ports only on the two available power ports in the console. I agree that the aluminum hub info states that it is not for charging devices, but I got nearly the same voltage and amp specs from that hub as I did with the black plastic hub that says it can charge only one device. Perhaps it will make a difference with more current draw. I will have to compare the two hubs once the Nomad wireless charger comes in. In the meantime, it is working with charging one device on the Tesla pad. As many may have read, Tesla offers a dashcam in Version 9 of the software update. The video for the dashcam will use a USB flash drive in the front console. This means that if you want to charge two phones you will need to use a hub that allows for at least two USB ports. I have completed testing on how a USB hub affects wireless charging while using two Samsung Galaxy S8+ phones on a Nomad Wireless Charger. I tested these phones without a hub and with a hub. This is using the aluminum hub shown above. I realize that the hub results actually increased the charge over the Nomad without a hub. This may be a result of the Nomad internal battery charging in the time between the two tests. Otherwise, it doesn't look like these is any effect on using a USB hub. I tried a random USB 2.0 bus powered hub that I had, and it is functional. The USB memory stick works as well plugged into the hub as it does connected directly. It looks like the overhead for the non-idle hub is about 0.13 amps, but it is only able to deliver about 0.15 amps for charging. At that rate my phone will lose battery life if the screen is on. A USB 2.0 hub should be able to get 0.50 amps, and deliver 0.30-0.40 to a phone. That isn't a fast charge, but it should be able to keep a phone topped up while it streams over bluetooth. A USB 3.0 hub should be able to draw 0.90 amps. I don't know any way other than trial and error to determine how well a hub will be at charging a phone. The car itself doesn't seem to care about the hub, and works fine. The best way I can think of to handle charging two phones and having a USB memory stick in place is to use one of those lipstick sized power banks inline between the phone and the hub. The hub will slowly charge the power bank, and the power bank can quickly charge the phone. Larger USB power banks usually need to be manually turned on when a device is connected to them, but the little ones are usually always on. The only problem is that of the thousands of lithium ion batteries I own, the one in my lipstick charger was voted most likely to burn up the car. This is exactly what I am wanting to do. I was gonna test it today if I can hit Fry's after work. I was actually lookin at the same style USB hub since it will sit flush in the back of the console. I don't a usb for music, but trying one to see if possibly this set up will work for my Jeda and the dashcam feature coming. I am tempted to go straight through the center console divider. But I am loath to do any holes at this point. Sort of. She "elongated the notch" where the rubber bumper is mounted to fit the cable in. It's still a really good solution. The only way I found to successfully get a cord in there without any permanent modifications was to pull out the cup-holder bracket (mounted with ~6 metal clips) and run the cable underneath it. The reinstalled bracket will pinch the cable a little, but you don't have make any cuts. Thank you all for finding a solution for this. I had been contemplating about running a wire back to 12v Cigarette lighter. This is such a simpler solution to be able to use the Nomad wireless charger and the coming dashcam functionality. Thanks again. The plastic hub (as I call it) has two 2.o ports and one 3.0 on the top. The aluminum has three 3.0 ports. "A USB 2.0 hub should be able to get 0.50 amps, and deliver 0.30-0.40 to a phone. That isn't a fast charge, but it should be able to keep a phone topped up while it streams over bluetooth. A USB 3.0 hub should be able to draw 0.90 amps." I actually pulled the aluminum and console trim off the center console in an attempt to route a USB extension cable from the power port in the rear part of the console to the USB area. I couldn't find a way to route the cable into the front USB area. There were too many obstacles from the lid openers. I tried to find a way out (from towards the firewall) to route the USB cable, and I couldn't find a way to do it. I think RPM Tesla finally has a video back up that shows that one has to notch the console under the trim. If it turns out I need more power, I might try this. But note that I couldn't get anymore power out of a USB power adapter than from the USB front port. I put in a dashcam a few months ago without pulling any panels. If you look here, you see how I routed the wire from the center console to the front right windshield. I am gonna experiment a little bit and if some (cheap) ideas don't pan out, and I like the DashCam feature, I may do this to route one wire to the front. I was gonna pull the trim at first as there are videos on it. When I did, it made a horrible cracking sound, so I just pushed it back in. Now that may have sounded worse than it was as I think the clips are metal, but I didn't wanna keep going at that point. So I decided to add a USB hub to my front port and see if I can run the Jeda Pad and play music. The USB showed up right away on the UI and I was able to play music from it and at the same time I was able to charge my old iPhone 6 with wireless charging case. This the result via Amperes App. Since my phone is old and not a fast charge, I checked my wife's iPhone XsMax. So the HUB does slow down the charging, but I will use the left side of the Jeda primarily as I drive. So will this work with the DashCam? We will see soon I hope. But the fact that it reads is encouraging. So I hope it will write. So I stopped at Frys on the way home and picked up a similar USB 3.0 Hub. I was able to play files and power the Jeda Pad at the same time. I hope this means it will be able to write the video files as well. Here is the link to what I just posted in the other thread. I don't have a USB amp meter like that, so I just did comparisons with the Amperes APP. I figured why not just get the 3.0 hub as it is supposed to be faster and newer tech and for $11.35 vs $6.99, why not? Honestly, since (at least at the moment) there is zero utility from connecting the phone to the car, wouldn't it be better to run the phone USBs to a simple 12v USB charger (using, or just wired to, the lighter circuit), and leave the forward car USBs for memory sticks? The specification for USB 2.0 says that a USB 2.0 data port can provide up to 500mA (0.50 amps), so I would not expect a USB 2.0 hub to provide more than 0.50 amps. For USB 3.0 the specification was updated to say that a USB 3.0 data port can provide up to 900mA. The hub I tested is not able to provide anything near 0.50 amps out of a single port. It is a 4 port hub, so perhaps the hub is reserving power for the other ports, or maybe it just can't provide much power. It was never designed to charge phones, but to let you plug in a keyboard, mouse, camera, etc. In my testing, the data ports on the Model 3 can provide 1 amp, so they might just be USB 3.0 ports, or there might be some other fancy logic in them to provide extra charging power. There are all sorts of things done to get more power over the ports, which is why some chargers can give 2 amps to an iPhone, but not Android, and vice-versa. Those are also the rules for data ports, not for things that are shaped like a USB port, but are really electrical outlets. Ya I dont know of any usb hub that will pass more than the usb standard power level. I have looked in the past for other projects and I have found powered hubs that have specific ports labeled for charging at 2a, but that doesn't help us. Not really. I use that 12V outlet for my dashcam and I was disappointed to find that there wasn't an internal route to the front storage compartment. She is actually a he (me) . I only elongated the notch under the right side rubber bumper the width and depth of the cord just so the rubber bumper would re-seat properly when installed on top. You could remove the cord and reinstall the bumper with no issue. Impossible to see any sign of the slightly elongated hole.